Earlier it was just Samsung, Nokia, and Apple for most of us. Now we have uncountable brands out there. We change our smartphones often and by this, we often struggle with taking proper backups. I primarily used Dropbox for taking backup of my pictures and videos, but I rarely used any specific method for taking backup of my installed Android apps. I usually download them once again from the Google Play Store, but when I have tonnes of apps installed, this could become a tedious task. We also had a discussion earlier in our DeviceBAR group regarding the same and then I came across this option in AirDroid Android app. I’ll share the steps below. 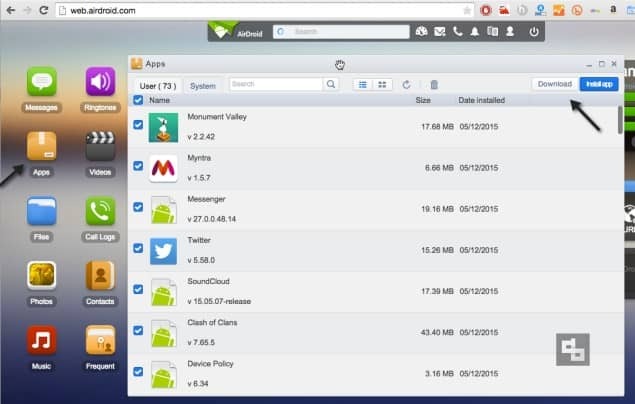 First you need to install AirDroid app in your Android device if you haven’t. Install it and configure it properly, just easy steps. After that open http://web.airdroid.com/ in your desktop browser. Login with your details, you’ll now see a dashboard with various options like Messages, Apps, Contacts, Files, etc. I usually use AirDroid for transferring some songs and files from my laptop to my mobile, but haven’t really used for taking backups. Now coming back to our target, downloading the APK files of the installed Android apps. Go to the “Apps” icon and open it, you’ll find a browser dialog box with all the installed apps (both user / system apps). Now it’s very simple, just choose the apps (using checkbox) for which you want the APKs and click the “Download” option. If you choose more than 1 app, then it’ll download as a .zip file. Awesome isn’t it. You can also install and uninstall apps through this. I remember seeing this option in AirDroid but rarely used it, now am gonna take backup of my entire Android apps installed.